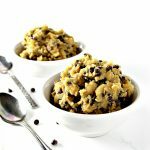 This egg-free Edible Cookie Dough recipe tastes super-delicious, is ready in about 5 minutes, and can be prepared either vegan or paleo. Mix in chocolate chips, dark chocolate pieces, or chopped macadamia nuts for variety. And if you’re in the mood to share, then there’s enough for two! In a medium mixing bowl, combine the almond flour with the coconut sugar and sea salt. Stir in the melted coconut oil, agave nectar (or whichever sweetener you choose), almond milk, and vanilla extract. Stir in chocolate chips or nuts, and, if desired, chill in the refrigerator for a few minutes so the batter can set. Keep stored in the refrigerator for about 2-3 days. The cookie dough will take on the flavor of the sweetener you use, so use one you will enjoy! I like agave nectar, maple syrup, and honey, in that order.